Problem: Design and execute a print advertisement in promotion of Play-Doh. The advertisement directly addresses the young parents who make up Play-Doh’s target demographic by referencing a familiar pain, while at the same time subtly jabbing one of the leading competitors. 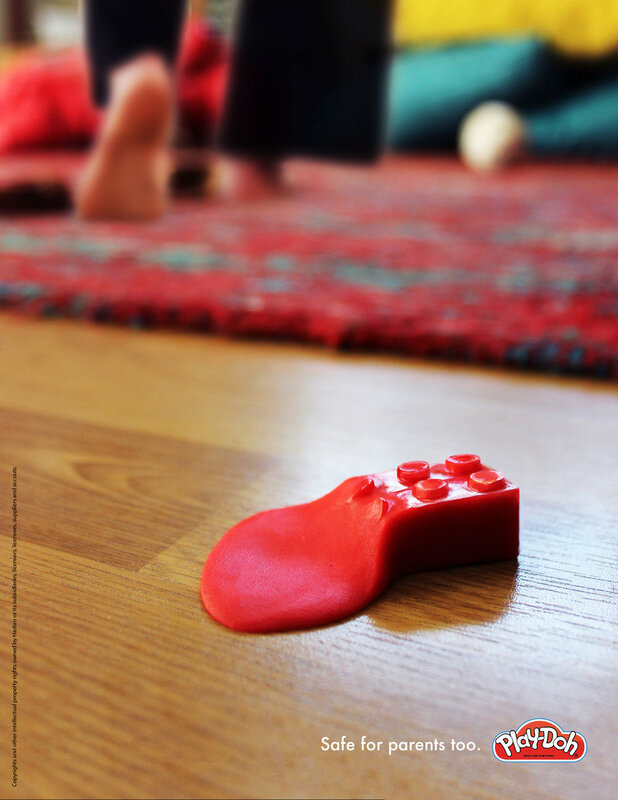 The “mooshed” lego was created using red Play-Doh and a Lego mold ice tray. Problem: Design an Ad campaign promoting Tom’s of Maine Deodorant. To help set Tom's apart from other deodorant Brands, this campaign focuses on their aluminum-free claim, which is an uncommon feature among leading deodorant brands. 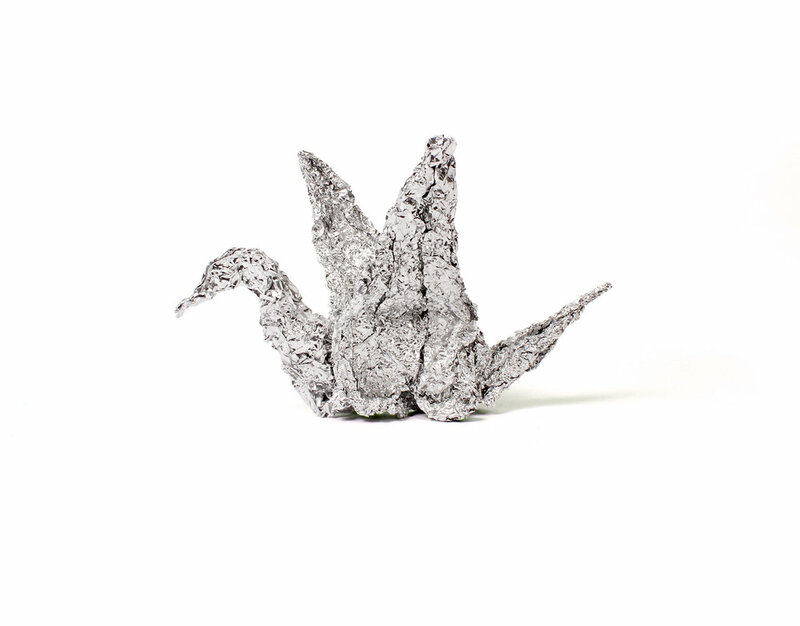 The aluminum foil, meant to represent aluminum content, is molded into shapes viewers will recognize to demonstrate the more responsible uses of the ingredient and to suggest that Tom's, unlike many other brands, knows to keep aluminum where it belongs. Along with keeping your lunch toasty, aluminum is also used in many leading antiperspirant brands, and has been linked to increased risk of breast cancer and Alzheimer’s disease. With Tom’s of Maine all-natural, aluminum-free antiperspirant, however, you can keep aluminum off your pits and where it belongs. Along with creating stunning art, aluminum is also used in many leading antiperspirant brands, and has been linked to increased risk of breast cancer and Alzheimer’s disease. With Tom’s of Maine all-natural, aluminum-free antiperspirant, however, you can keep aluminum off your pits and where it belongs. Along with protecting your brain from unwanted alien signals, aluminum is also used in many leading antiperspirant brands, and has been linked to increased risk of breast cancer and Alzheimer’s disease. With Tom’s of Maine all-natural, aluminum-free antiperspirant, however, you can keep aluminum off your pits and where it belongs. Problem: Create an advertisement promoting a social cause. 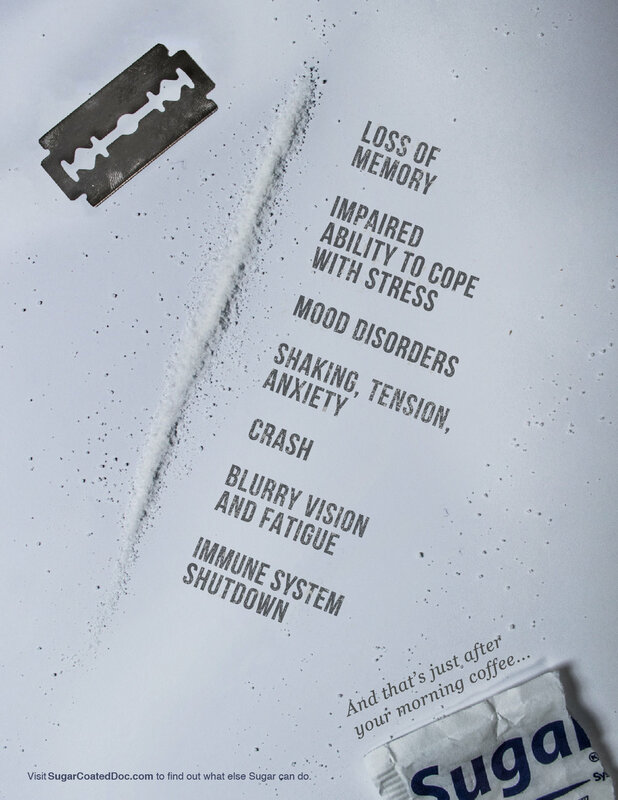 This social cause advertisement borrows imagery and tone associated with abusive drugs to send a bleak message about the lesser-known dangers of sugar-consumption.